MIRAMICHI, N.B. 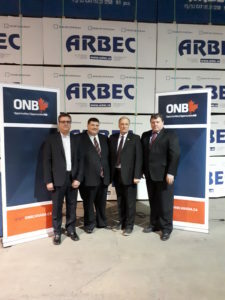 – Opportunities NB and the New Brunswick government are investing up to $1 million to support a $10-million upgrade of Arbec Forest Products’ production facilities in Miramichi. The investment will secure new equipment and technology for a facility that produces oriented strand board for the construction industry. It is expected the new equipment will increase productivity and quality control, maximize raw materials, be more environmentally-friendly and improve overall competitiveness. The provincial investment of up to $1 million is in the form of a non-refundable contribution, with $500,000 coming from Opportunities NB and $500,000 from the Miramichi Regional Economic Development and Innovation Fund. From left: Transportation and Infrastructure Minister Bill Fraser, who is also minister responsible for the Regional Development Corporation; Miramichi Deputy Mayor Brian King; Pierre Gingras, executive vice-president of Arbec Forest Products; and Les Flett, Miramichi mill manager, Arbec Forest Products. Opportunities NB is a Crown corporation that seeks to attract and support opportunities to grow the economy and create jobs. Production at Arbec’s Water Street plant has significant secondary economic benefits by supporting jobs in the forestry and transportation sectors.